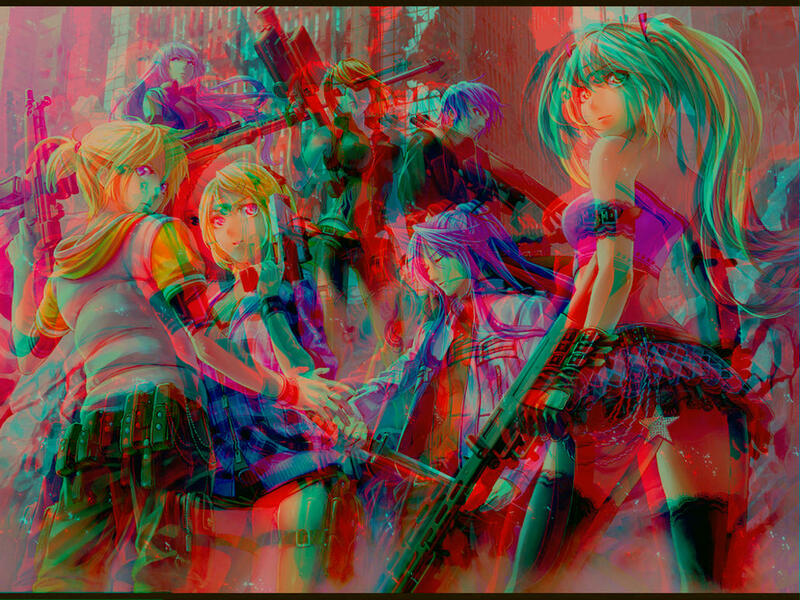 Here's a small demo program on how to extract the individual images from a 3D Anaglyph image. Since there exists both Red/Green and Red/Blue versions of these, it extracts all three colour parts. Nice one, HeartWare. It works really well. This demo shows how to draw with new (version 8.0) brush tools, clone tools, crop tools and use of new image and text layers with undo, redo, resampling, resizing and converting bitdepths. The demo also displays layer frames with multiframe images, screen captures, use of solid, gradient, spray, textured, center textured, textured spray, image and erase brushes along with showing how to use BrushTool.TransparencyMode. Update 1: PalUtils.pas added to distribution. Eureka log defines removed from project. Performance improved by removing the call to DrawLayers in the OnMouseMove event. Update 2 07/31/2918: Added missing dependent unit source files to distribution: RGBHSVUtils.pas, RGBHSLUtils.pas, RGBCIEUtils.pas, RGBCMYKUtils.pas, HTMLColors.pas. Work commenced on future update for Shape, Line and Polyline layer suppport. Update 3 08/01/2018: Added missing Scanlines.pas unit. 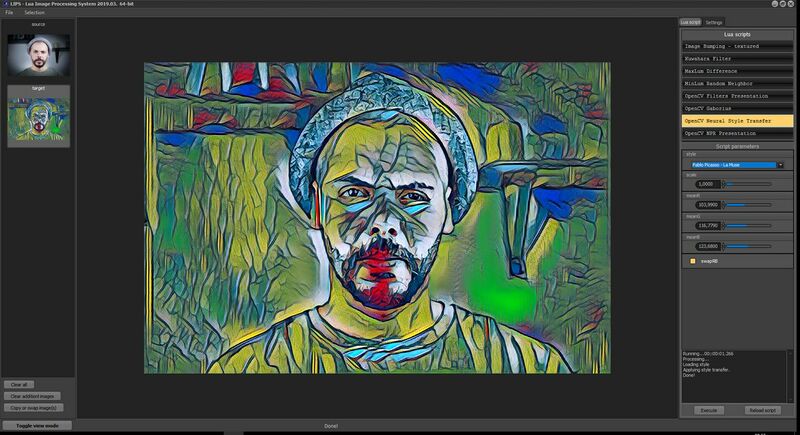 Update 4 08/10/2018: Added image processing and analysis functionality and Color Curves. Note the current version of iexColorCurve.pas will not function with 64-bit compile. The problem has been fixed so contact the developer if you need to use color curves with 64-bit. Update 5 09/09/18 Final update- minor edits and some improvements. 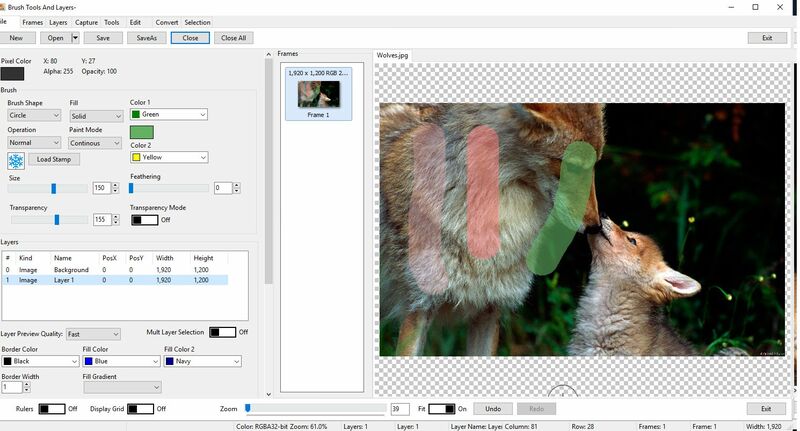 Update 6 09/22/18 Added ImageEnLayerMView, ColorPicker and floodFill. Update 8 12/05/18 Added mxs.inc used by palutils.pas. Update 9 12/06/18 Corrected error in Open1Click procedure. works well with ImageEn and requires little source code to implement. 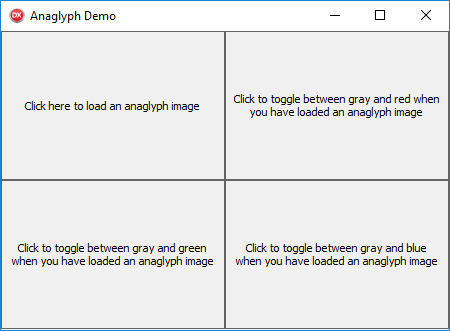 support to Delphi and C++Builder applications for Microsoft Windows. drop behavior of many popular commercial applications. I have used the Melander DragAndDrop component in older versions of Delphi but is several years old now and unfortunately, I have not been able to get it to compile in Delphi Tokyo. 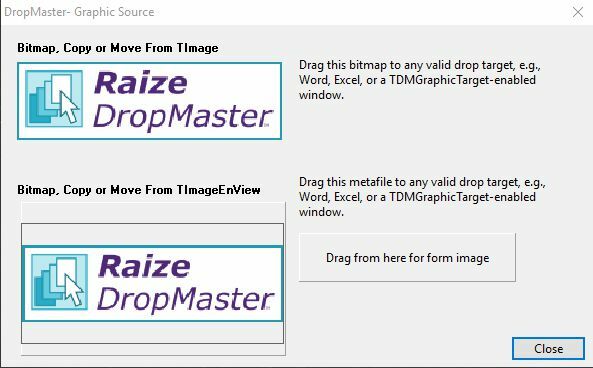 The Graphic Source Demo allows dragging an image from TImage and TImageEnView to OLE enabled drag and drop applications such as Microsoft Word, Microsoft Edge and the DropMaster Graphic Target Demo. LMD NG Drag&Drop is a part of Next Generation (NG) package suite. All these packages are based on new IDE and language features of latest Delphi IDE versions. NG Drag&Drop provides the ability to exchange data with other applications via standard Windows OLE drag&drop protocol. These demos show how to drag images from one application to another utilizing OLE drag and drop. VCL drag and drop does not allow drag drop between applications, but OLE does. 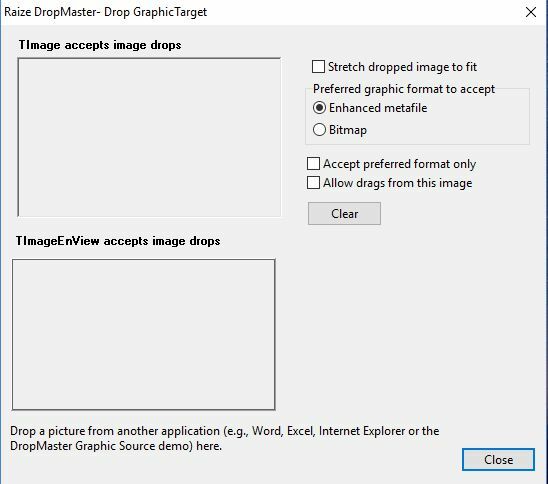 OLE drag and drop is usually implemented by delphi components. These demos utilize the LMD NG DragAndDrop components. 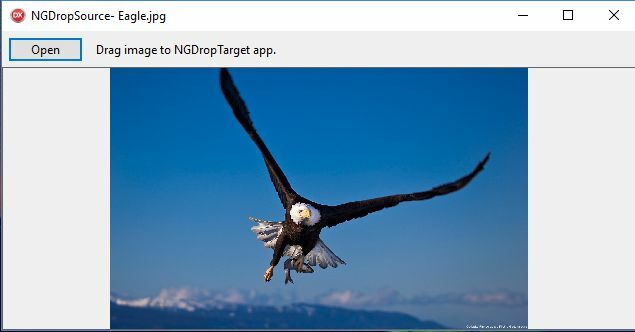 NGDropTarget Demo which uses TNGDropSource to configure dragging data and initiate drag&drop operation (source side). NGDropSource Demo which uses TNGDropTarget to receive dragging data by registering some application's control as a drop target and providing related events like OnDragEnter, OnDragOver, OnDragLeave, OnDrop; and a single OnDragAction event, which can be used instead of all previously mentioned events to simplify code. Recently IE has made good strides in the direction of adding missing UI elements and refining the existing UI elements. But before IE acquired the Layer Control/Palette for visual layer management I had developed my own version of Layer Palette. My current implementation come more closet to Layer Palette of Photoshop. 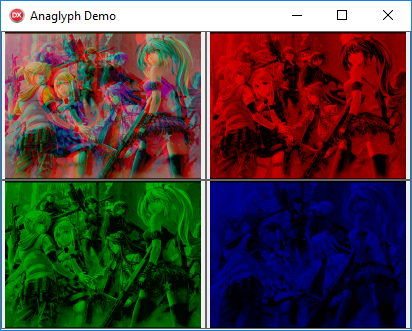 Current implementation lacks drag and drop for layer arrangement and I am working on it at present. And it is not as polished as what is offered in Photoshop but nevertheless it is usable! And it is a crucial part of our bigger project. I thought that I did share my creation. Sorry, I forgot to attach a screen shot. That looks good. I like the way you show masks together with the associated image (we have that on the to-do list). You might want to alpha draw the eye and link button so they match the color of the background. As for the icons. I have currently used TSpeedButton. But will update it soon to look more professional. Are you planning to build and release x64 version of spHost? but I can try to build 64-bit version. Somehow I doubt it will work. Hi wesleybobato, Can you kindly share your GPU Chromekey project? 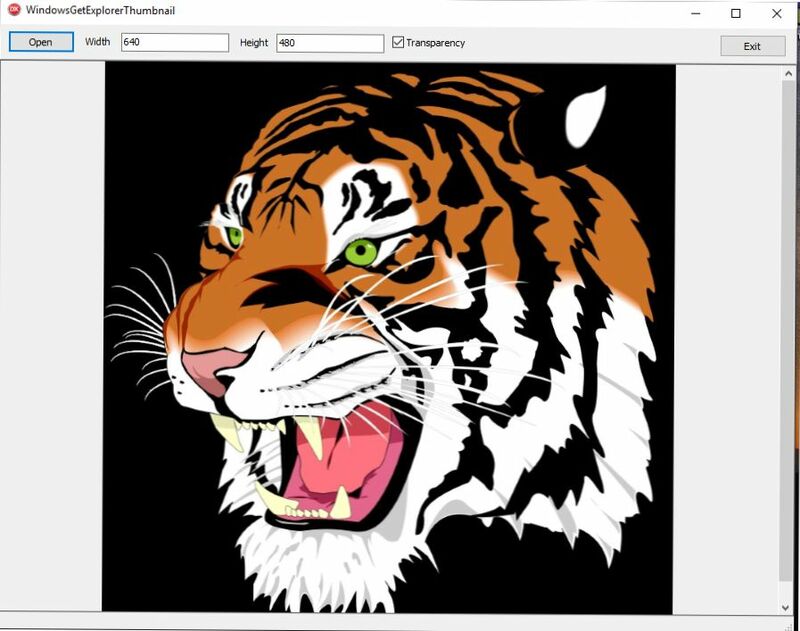 This demo shows how to open SVG images as a raster image with WindowsGetExplorerThumbnail function. SVG images are a vectorial file format Scalable Vector Graphics (SVG) is an XML-based vector image format for two-dimensional graphics with support for interactivity and animation. The SVG specification is an open standard developed by the World Wide Web Consortium (W3C) since 1999. The WindowsGetExplorerThumbnail function loads ImageEn with a TBitmap or an TIEBitmap. 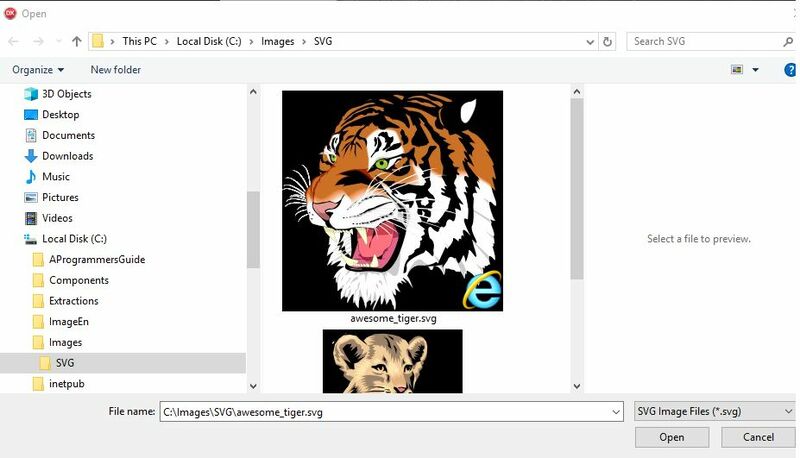 The SVG image stored in a TBitmap and TIEBitmap can not be edited or saved to disk as an vector SVG image. 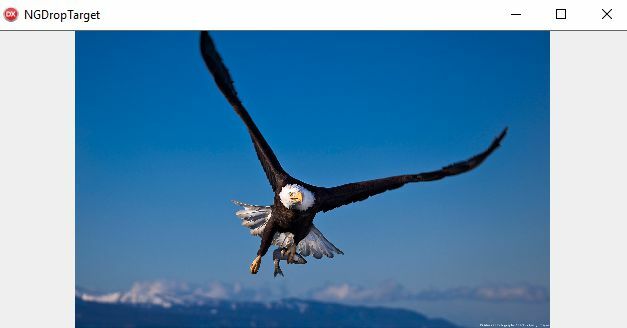 The image in the TBitmap or TIEBitmap can be saved in any of the ImageEn file formats which are all Raster images. Returns the thumbnail from Windows Explorer for the specified file, which can be an image or a video file. Result is false if no thumbnail is available for the file. SVG images may be opened into ImageEn by using RiverSoftAVG. The RiverSoftAVG component can load SVG images as a raster image. As of December 18, 1018 an experimental unit, RSSVGDesignCanvas.pas/FMX.RS.SVG.DesignCanvas.pas, which have classes that can build SVGs using TCanvas graphics operations. I have not tried or tested the RSSVGDesignCanvas method. When Delphi is not running, applications compiled with the library will display a nag screen. The core of the system are two DLLs: lipsEngine.dll and ocvWrapper.dll. 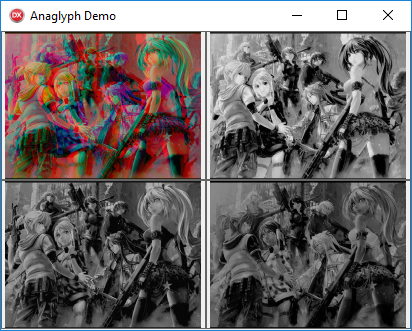 The first one deals with LuaJIT engine, the second one is a wrapper for a limited set of OpenCV 4.0 filters and image processing routines. Host application (C++/Delphi) -> lipsEngine.dll -> ocvWrapper.dll. To use Lua engine you need to convert lipsEngineDLL.h and lipsGlobals.h to respective pas files. If you want to use ocvWrapper.dll directly from Delphi, you need to convert ocvWrapper.h and ocvGlobals.h to respective pas files. Nice one, Spetric. 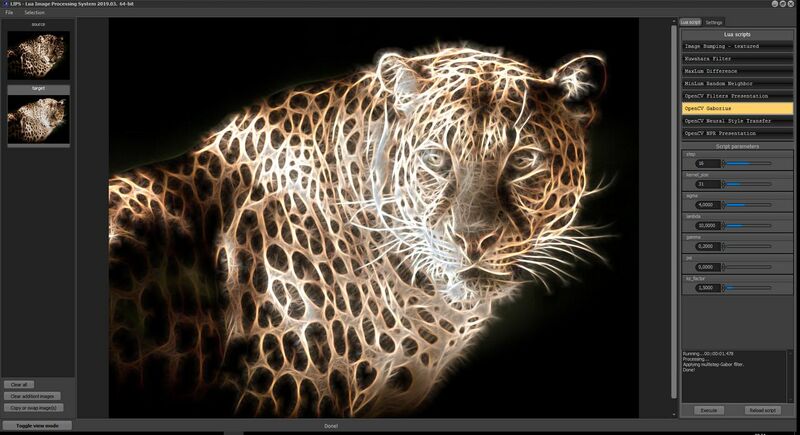 It gives access to some very cool effects.